A well-trained and knowledgeable food handler is the backbone of food safety in the retail foodservice setting. NEHA’s Professional Food Handler (PFH) Certificate Course provides these frontline workers access to essential knowledge and an understanding of core food safety practices that they need to carry out their work safely. 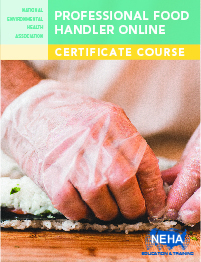 The Professional Food Handler Certificate can be obtained online or with an instructor. The two-hour course includes an online assessment and is based on the 2017 FDA Food Code. The course includes seven modules, and Certificate is available upon completion. 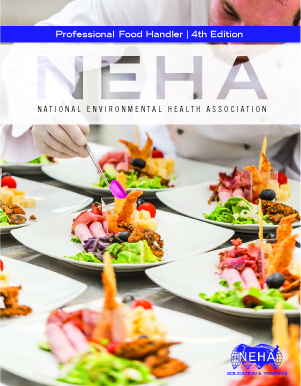 NEHA’s Food Safety Training program maintains a network of hundreds of qualified Food Safety Instructors that provide training and assist us in protecting public health. This course is ideal for meeting the requirements for food handler employee training by state and/or local jurisdictions. Participants will receive their Food Handler Certificate upon course completion. *Check with the state of Florida for Florida-approved food handler training. The Professional Food Handler textbook helps support both the online and instructor-led courses. The textbook includes important food safety practices, the latest information about food safety and pathogen controls, charts, and informative graphics. "I just completed the course. It is is a well-done format and presentation." "I am happy I selected this course!" "Very clear and nice images for visual learners." "Easy format to understand and follow. Really informed me about the importance of keeping the work station clean and good hygiene."